Syria next ex-colony for French 'humanitarian' intervention? More reports of armed gangs, snipers, and dead Syrian security forces. Bangkok, Thailand May 2, 2011 - As the media circus over Bin Laden's latest reported death just begins to set up camp, Syria is still fighting desperately against an admittedly foreign-funded campaign of sedition and unrest. Meanwhile, the West is attempting to increase pressure on Syria via sanctions and by expanding support for further intervention. Syrian security forces have recently overrun the city of Deraa claimed to be the "cradle" of the "pro-democracy" protests. The operation coincides with widespread arrests and an amnesty offer by the Assad government for protest leaders to turn themselves in to avoid prosecution. Perhaps fearing order will ultimately be restored, the West has increased pressure on the Arab League to "take a stance" against Syria's crackdown. While the corporate owned media continues to rely on "rights groups" and their "witness accounts," most of which are admittedly being funded, directed, and equipped by the US, Syria's state news service SANA has reported that on Monday the army "tracked down terrorist groups that have terrorized civilians and killed 10 of its members and arrested 499 of them." SANA also reported that security forces "killed five snipers who were shooting at pedestrians." This concurs with earlier reports and an increasing amount of evidence that suggests, just as in Libya, Egypt, Tunisia, and last year in Thailand, the foreign-funded "pro-democracy" protesters are serving as unwitting fodder for armed militants and provocateur gunmen. insists that armed elements are operating amongst the protesters. revolutions facing competent security forces. It should be noted that in Brookings Institution's "Which Path to Persia?" report, the option of providing military support for US-sparked "popular revolutions" was not only considered, but deemed as an absolute necessity for nations with fully functioning and competent security forces. The combination of popular revolution, insurgency, and inviting a military coup were all discussed and suggested for use in tandem. Undeniably this formula, despite being fashioned for Iran, has served as a template for the entire "Arab Spring." The report states, "as far as the regime change options themselves, an American administration might choose to pursue all three of the specific routes—popular revolution, insurgency, and coup—on the grounds that doing so would increase the likelihood that one of them will succeed. Moreover, employing all three simultaneously might create helpful synergies among them. For instance, if the regime becomes bogged down fighting various insurgencies, Iranian military officers might become convinced that the leadership must be replaced and that there is an opportunity to do so." It continues by specifically mentioning the use of military aid to perpetuate popular revolutions by stating, "consequently, if the United States ever succeeds in sparking a revolt against the clerical regime, Washington may have to consider whether to provide it with some form of military support to prevent Tehran from crushing it." In Libya, quite obviously this has been done on record, and emerging evidence suggests that it is now being done in Syria. Syria has long been slated for regime change. In 2002, then US Under Secretary of State John Bolton, would add Syria to the growing "Axis of Evil." It would be later revealed that Bolton's threats against Syria would manifest themselves as covert funding and support for opposition groups inside of Syria spanning both the Bush and Obama administrations. In a recent CNN article, acting State Department spokesman Mark Toner stated, "We're not working to undermine that [Syrian] government. What we are trying to do in Syria, through our civil society support, is to build the kind of democratic institutions, frankly, that we're trying to do in countries around the globe. What's different, I think, in this situation is that the Syrian government perceives this kind of assistance as a threat to its control over the Syrian people." Toner's remarks come after the Washington Post released cables indicating the US has been funding Syrian opposition groups since at least 2005 under the Bush administration and was continued under Obama. As we can see, the campaign against Syria transcended presidential administrations for nearly two decades. In a recent AFP report, Michael Posner, the assistant US Secretary of State for Human Rights and Labor, stated that the "US government has budgeted $50 million in the last two years to develop new technologies to help activists protect themselves from arrest and prosecution by authoritarian governments." The report went on to explain that the US "organized training sessions for 5,000 activists in different parts of the world. A session held in the Middle East about six weeks ago gathered activists from Tunisia, Egypt, Syria and Lebanon who returned to their countries with the aim of training their colleagues there." Posner would add, "They went back and there's a ripple effect." The West, perhaps seeing their window of opportunity closing, has become overtly aggressive in both their ongoing military campaign in Libya and their attempted military intervention in Syria. Indeed, calls have increased to exact a similar intervention against Assad that is currently unfolding against Libya's Qaddafi. All of this must be seen within the greater context of the admittedly foreign-funded and engineered "Arab Spring," and the greater campaign unfolding against Moscow, Beijing, and their peripheries. The head of the United Nations nuclear agency has said for the first time that Syria tried to secretly build a nuclear reactor. Yukiya Amano said the target destroyed by Israeli warplanes five years ago "was a reactor under construction". Syria denies the bombed building had any nuclear uses and also rejects claims that it is hiding secret atomic activities. Previous International Atomic Energy Agency reports have suggested that the structure hit could have been a reactor. But Mr Amano's comments were the first time the agency has said so unequivocally. Syria has stonewalled IAEA attempts to follow up on an initial 2008 visit to the site. Posted: Tue May 31, 2011 1:30 am Post subject: Who cares in the Middle East what Obama says? excerpt from: Who cares in the Middle East what Obama says? Watching the hundreds of refugees pouring from Syria across the northern border of Lebanon, the Turkish government is now so fearful of a repeat of the great mass Iraqi Kurdish refugee tide that overwhelmed their border in the aftermath of the 1991 Gulf war that it has drawn up its own secret plans to prevent the Kurds of Syria moving in their thousands into the Kurdish areas of south-eastern Turkey. Turkish generals have thus prepared an operation that would send several battalions of Turkish troops into Syria itself to carve out a "safe area" for Syrian refugees inside Assad's caliphate. The Turks are prepared to advance well beyond the Syrian border town of Al Qamishli – perhaps half way to Deir el-Zour (the old desert killing fields of the 1915 Armenian Holocaust, though speak it not) – to provide a "safe haven" for those fleeing the slaughter in Syria's cities. oooh will they go ahead anyway? According to an incremental plan, Turkey will start supporting tougher UN resolutions if the regime fails to live up to the expectations of the international community. The strongest message yet to the Syrian leadership was conveyed by Foreign Minister Ahmet Davutoğlu, who spoke with Syrian President Bashar al-Assad's special envoy, Hassan Turkmani, earlier this week. “We underlined that Turkish support to Syria hinges on the willingness of the Syrian government to adopt sweeping reforms in the country. We detailed our suggestions before and even relayed a written proposal to Damascus on how they should proceed to stabilize the country,” the source explained. “Actually, the situation in Syria is not exactly like the one in Libya. Syria is practically a domestic issue for us, I have said this many times. We have a [common] border that extends for 850-900 kilometres. I say this clearly and openly, from a humanitarian point of view, his brother [Maher Assad] is not behaving in a humane manner. And he is chasing after savagery. Their appearance next to the women they have killed is such an ugly sight. These scenes are hard to stomach. Note: The excerpts above have been transcribed and translated from Turkish by Cem Ertür. The Syria for Change conference, a three-day meeting held by opponents of the Syrian government in the southern Turkish city of Antalya, ended on Friday with the participants declaring their full support for the revolution and regime change in Syria. excerpts from: Who cares in the Middle East what Obama says? Turkish generals have thus prepared an operation that would send several battalions of Turkish troops into Syria itself to carve out a “safe area” for Syrian refugees inside Assad's caliphate. 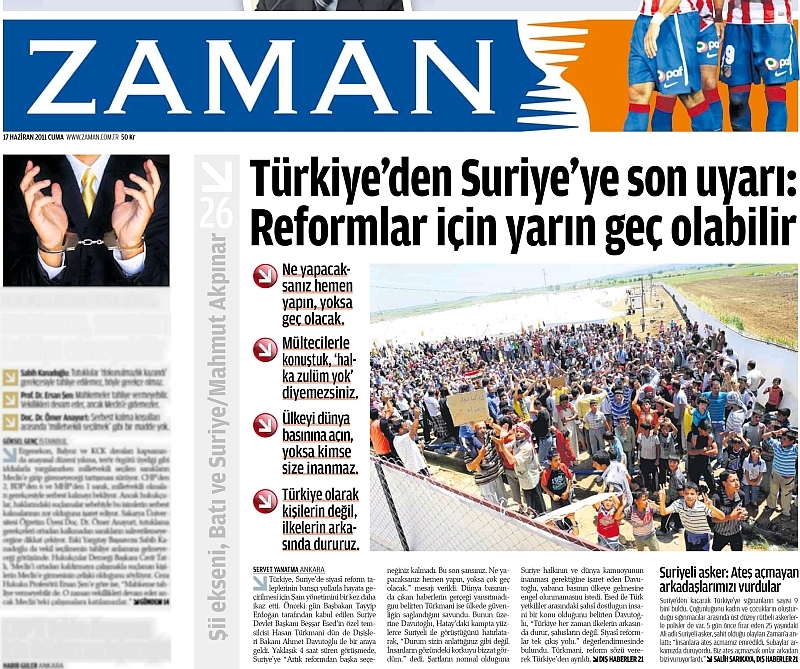 The Turks are prepared to advance well beyond the Syrian border town of Al Qamishli – perhaps half way to Deir el-Zour [...] to provide a “safe haven” for those fleeing the slaughter in Syria's cities. Turkey may send its military forces into Syrian soil to establish a “buffer zone,” should the current unrest in Syria skyrocket into a refugee crisis that would pose a threat to Ankara, a report says. Turkey's smear campaign against the Syrian government is much worse than the propaganda spread by Arab media to tarnish the image of Damascus with regards to its recent unrest. Libyan scenario for Syria: Towards a US-NATO “humanitarian intervention” directed against Syria? "British nationals should leave now by commercial means whilst these are still operating. [...] Our advice is very clear, because of the current situation, we advise against all travel to Syria. We ask British Nationals to heed this advice and leave the country now. by Umberto Eco, David Grossman, Bernard-Henri Lévy, Amos Oz, Orhan Pamuk, Salman Rushdie, Wole Soyinka. We are calling your attention to the dramatic situation in Syria and to the Security Council’s proposed Resolution regarding Syria. You are well aware of the situation in Syria which has been submitted to your attention. Whole cities such as Deraa, Homs, Lattaquié, Kamchli, Banyas, whose names have become familiar to us all, have been cut off from the world, deprived of electricity and telephone communications. These cities are patrolled by tanks in the streets and by helicopters in the air, shooting into the crowds, sniper fire from the roof-tops striking the people below, militia bursting into homes one by one and abducting men between the ages of 15 and 80. You must surely know the names of these prisons where they are herded : Tadmor (Palmyre) ; Palestine, Adra, Douma (Damascus) ; Sied Naya : the Hades of Syria. You must surely know of the tortures these thousands of men endure. You are most certainly aware and appalled, as we are all, of how students, democrats, ordinary citizens are treated, throughout the country, people who peacefully request a dignity and freedom they have never had at the price of thousands of arrests and hundreds of deaths. The Syria of the El Assad clan is a dictatorship passed down from father to son for over forty years and who, with total impunity has instilled fear in the very heart of each citizen using barbaric means and overriding each and every humane law. Millions of defenseless citizens were forced into rebellion. This friendly and hospitable people were pushed to their limit and, with their bare hands, knowingly faced a death machine aware of the heavy price they would pay. For the last two months, the demonstrations in Deraa, Homs, Kamchli, Banyas and Lattaquié have ended in massacres by the army, militia and secret service. However, regardless of the terror and with great courage, the protestors, after burying their dead, would begin again the next day. This is admirable. This is monstrous. This happens behind closed doors within sealed borders. Humanitarian organizations and the international press are banished. “Silence, we’re shooting”! Mr. and Ms. Ambassadors, you of all people are aware of the situation and at this very moment are faced with decisions. In fact, the international community has already begun to act. Germany, Great Britain, France and Portugal have proposed a Resolution condemning this repression and which should be submitted to the Security Council of the United Nations of which your fifteen nations are current members. The outcome of this Resolution is in your hands. It qualifies the repression in Syria as a Crime against Humanity. It does not propose sanctions against Syria nor military intervention. It is limited to condemning the repression and clearing the path for investigations into the Crimes Against Humanity. However limited, this Resolution is necessary. Mr. and Ms. Ambassadors, for the battered people of Syria and their peaceful fight for freedom, it is essential that you adopt this Resolution. With current unanimous international pressure and support by the Security Council, the Syrian government could eventually cease the massacres it inflicts upon its people daily throughout the country and with total impunity. International public opinion, above and beyond its diversity, would finally be heard sending a message throughout the world affording immense comfort to the Syrian people and confirming the moral influence of the Security Council and each of its member states all becoming advocates of a universal conscience! We strongly hope that this proposed Resolution be submitted for review and vote by the Security Council. It must imperatively obtain in advance the greatest amount of support by you, Mr. and Ms. Ambassadors of the Security Council. It would be tragic and morally unacceptable if, because of the threat of an eventual veto or the occasional abstention here or there, this proposed Resolution not be reviewed by your conscience only to finish in the bin of abandonment. Moscow has raised concern over France supplying weapons to Libyan rebels and over ambigious interpretations of the UN Security Council resolution on Libya. Foreign Minister Sergey Lavrov has also once again said that the sides in the Syrian conflict should resolve their differences through dialogue only. Investigative journalist Webster Tarpley, who's in Tripoli, shared his views with RT. Editor’s Note: WARNING – Photos and hyperlinks in the ’conclusion’ section of this essay are of extremely graphic nature. They have been included in this piece due to their unequivocal importance to the overall view of what is taking place in Syria. The hasbara (propaganda) that is spread throughout the Zionist-owned mainstream media is identical in nature to a house of cards. No matter how imposing the house may be, remove one card from the structure, and it shall immediately collapse in an almost glorious fashion. It is due to its foundation; its towering essence is overshadowed by its flimsiness. The Zionist media imposes its hasbara in terrorizing fashion; like the usurping Israeli entity’s bombs falling upon illegally besieged Gaza or Lebanon, the hasbara enters the psyche as an F-16 bombardment. But unlike the bombs, which are so unstoppably and menacingly destructive, the hasbara is weaker than the web of a spider coming in contact with a machete. Remove just one element, one detail from a news story laced with hasbara, like the house of cards, the aforesaid story will crash to the ground, broken and dismembered. This house of cards is what has been built upon the events unfolding in Syria, where President Bashar al-Assad is facing an uprising not seen since his father’s days. The Zionist media, in partnership with ‘Arab’ media giant Al-Jazeera, painted a rosy picture of heroic, peaceful demonstrators rising up against the dictatorship that has ruled their nation repressively for more than four decades. But that is all that it is, a picture; a story not rooted in reality or fact. Al-Jazeera has finally admitted, that the opposition has lied and exaggerated about casualties and protest numbers (1), to ‘further its cause,’ of course, in typical hasbara fasion, but this small admission, this small card removed from the frame, brings the house of cards crashing down. Al-Jazeera’s admission only gives further credence to what has already been exposed: the Zionist entity and the House of Saud, allied with the US, Turkey and Jordan, have launched a full-scale destabilization operation against Bashar al-Assad and his government. Mobilizing its forces from certain ‘hotspots,’ or joint operations rooms, the Zionist-Saudi axis has used its agents ex-Syrian VP Abdel-Halim Khaddam, AIPAC member Farid al-Ghadry, Brookings Institution Fellow Ammar AbdulHamid, State Dept giant Jeffrey Feltman and multiple Syrian Muslim Brotherhood leaders to fund, incite, train, guide, organize and direct its agents within Syria to drive the Assad leadership into the ground in hopes of replacing it with an anti-Iran, anti-Hezbollah regime subservient to the Zionist-Saudi axis. With weapons being provided by Jordan and armed operations initiated by Zionist agent * al-Dhari, Syria has been plunged into chaos (2). Feltman’s role is crucial, as he developed the final phase of this plot with Saudi National Security Advisor ‘Prince’ Bandar bin Sultan, spending $2 billion in the process (3). The Zionist entity’s hopes of prolonging the ‘kiss of democratic death’ destablization operation and weakening Syria, prior to invading it, destroying it and colonizing it as it did with 13 years of sanctions against (occupied) Iraq, seem to have died down. It seems the next phase has already arrived. Events in the last week have spun out of control at lightning speed and Zionist mobilization has kicked into high gear. Syrian Crimes Against Humanity: Fact or Pretext For Invasion? Amnesty International (AI) has a long, disturbing history of collaborating with globalist powers to foment illegal wars and conquer indigenous resources and territory. A corporate member of the Chatham House and bankrolled by Zionist billionaire war criminal George Soros, AI is a ruthless organization that has fooled a great deal of people due to the mask of ‘human rights’ that it parades around in. Most infamously, in the ‘incubator babies’ scandal, it represented an integral wing of the Zionist operation against Iraq just prior to the criminal Gulf War, disseminating horrific propaganda across the globe, portraying Iraqis as animals and baby killers to justify the invasion. The story was revealed to be false on absolutely every level, but AI’s mission had already been accomplished: the Zionist war against Iraq had begun. Over the years, AI has directed mountains of hasbara against Syria, specifically towards Bashar al-Assad’s father, the late Hafez al-Assad (4). On June 6th 2011, Amnesty International accused the Syrian government, under the direction of Bashar al-Assad and his top officials, of committing crimes against humanity in the town of Tell Kalakh. AI stated that ‘scores of men’ were arbitrarily arrested, tortured and at least 9 had died in custody. Seemingly infuriated, AI thundered in its report that the Syrian regime would respond to nothing but ‘concrete international measures.’ The report was a call to the UN Security Council and International Criminal Court to take action against Bashar al-Assad. A very gripping account indeed; one that pulls right at the heart strings in a whirlwind of emotion. A civilian population under siege at the hands of a monstrous dictator and his security apparatus. But a problem exists within this account; a very prominent, drastic problem. AI obtained all of the information from ‘eyewitnesses’ in Lebanon in addition to telephone conversations (5). First and foremost, how can ‘crimes against humanity’ accusations be made without any physical evidence provided? Secondly, how can an ‘independent’ NGO have such power that it can demand action to be taken against the nation it is accusing of such crimes from the highest international bodies on earth and be taken seriously? Thirdly, with Amnesty International’s track record of fabricating ‘humanitarian crises’ for the benefit of Zionist hegemony, how can such accusations even be considered credible? Fourthly, if villagers are armed and firing on soldiers and policemen, they are not civilians; ‘eyewitnesses’ be damned. And if they’re not civilians, ‘crimes against humanity’ are out of the question. On that note, why hasn’t AI reported on the hundreds of Syrian security forces shot dead across Syria by armed Syrian Muslim Brotherhood fighters (6)? Specifically, why hasn’t AI reported on the Syrian security forces shot dead in Tell Kalakh? At least 2 were killed and more than 7 were badly wounded (7). This crucial piece of evidence simply reaffirms that these are not peaceful protesters but gunmen. It reaffirms that what is unfolding in Syria is not a ‘peaceful uprising’ but an armed insurrection. And it reaffirms, that AI’s ‘crimes against humanity’ accusations against Syria are monstrously false. With that said, who are these so-called ‘eyewitnesses’ that AI met in Lebanon? And why were the meetings held in Lebanon? Why not Cyprus, Greece, Turkey, the Zionist regime itself or any other neighboring entity? Were these ‘eyewitnesses’ provided to AI? If so, by whom? The reason why these particular questions are so vital, is because former Lebanese Prime Minister Sa’ad Hariri’s Future Movement has worked closely with Zionist Near East Affairs asset Jeffrey Feltman and US Ambassador to Israel Dan Shapiro in organizing the press campaign against Syria ( , shaping public opinion in the region, and it would by no means be out of the ordinary if AI’s ‘Lebanese sources’ were provided by the Feltman-Hariri-Shapiro coordination, considering AI’s history of collaborating with Zionism and the role being played in Syria by the aforementioned three men. Yet again, Amnesty International has been exposed manipulating and fabricating information to justify a take-down of what the Israeli entity and its allies commonly refer to as a ‘hostile environment.’ Yet again, Amnesty International shows that its true colors are not its typical yellow, but Israeli blue and white. Just two days after Amnesty International submitted its (now-debunked) ludicrous claims of Syria committing crimes against humanity in Tell Kalakh, the US and French Ambassadors to Syria made an unauthorized trip to Hama, a stronghold of the Zionist-Saudi axis’ operations against the Bashar al-Assad government. The US State Department called the visit a ‘show of solidarity with the protesters.’ And the solidarity was reciprocated. ‘Protesters’ disgustingly placed olive branches and roses on the vehicles transporting the Western ambassadors as they chanted ‘down with the regime!’ The perturbed Syrian Foreign Ministry, rightfully, blasted the unauthorized visit as incitement. Also, it is not a coincidence that enemies of Al-Jumhuriyyah al-Arabiyyah as-Suriyyah would travel to an anti-government hub as the government prepared to hold a national dialogue and end the nightmarish unrest in the country (9). There is another element that the US State Department did not reveal to the public. An element behind the curtain, behind the ‘solidarity.’ The primary reason why US Ambassador to Syria Robert Ford traveled to Hama was to deliver tapping devices to the Syrian Muslim Brotherhood-dominated opposition. The devices were meant to capture images of their protests to later be amplified prior to airing them with the international Zionist media. The devices were also meant to spy on Syrian security forces, including the army and police in anti-Assad areas. While Syrian security forces dismantled a good deal of these apparatuses, many of them still exist in the Saudi-Zionist-backed opposition’s strongholds (10). US Ambassador to Syria, Robert Ford. This is simply another example of foreign powers meddling in the internal affairs of Syria to accomplish the mission of toppling Bashar al-Assad and replacing him with a puppet that will happily bow before the international dominance of Zionism. It is excessively important to document that this batch of incitement, while blatant, is nothing but the proverbial tip of the iceberg. Weapons, monies, intelligence and military support have been provided to the Syrian Muslim Brotherhood and its offshoots by the Zionist-occupied governments in the EU, US and Jordan to drown out the cries of the peaceful reformists who have been fully acknowledged by the Assad leadership (11). The Ambassadors’ incitement and delivery of materials represents the culmination of more than 3 months of destabilization at the Zionist-led coalition’s hands; an overt act of subversion on top of all of the various covert operations. This infuriated the Syrian people, who have marched in the millions over the last few months in support of the Bashar al-Assad’s Resistance government (12). Their fury was expressed in the streets as hundreds marched to the US and French embassies in Damascus. Protesters broke the embassies’ windows and thunderously chanted against the Western regimes’ meddling (13). In the aftermath, avid Zionist and murderous war criminal Hillary Clinton responded to the rage of the Syrian people and sharpened her sword of rhetoric. She explicitly stated, “He (Bashar al-Assad) has lost legitimacy, he has failed to deliver on the promises he’s made, he has sought and accepted aid from the Iranians as to how to repress his own people. He is not indispensable (14).” The arrogance of Clinton is nauseating; as if she and her government, who take their orders from the Zionist regime that has stolen al-Quds, have the right to dictate who will or who will not lead Syria; as if the majority of the Syrian people who support the Assad government and its Resistance don’t exist. If the elements of the ‘Syrian Revolution’ that are calling for Bashar al-Assad’s ouster were actually indigenous, legitimate, honest, ‘pro-democracy’ protesters and not a militia-type force that is being armed and directed by an axis of foreign powers led by the Zionist entity and Saudi Arabia, why did they welcome the US and French Ambassadors to Syria with roses? Why would those who claim to represent the typical Resistance-based mindset that the righteous, dignified and strong Syrian people tend to have, show solidarity with nations that are enemies of Syria and are actively pursuing its downfall? And knowing that Syria has been a target perpetually locked in the crosshairs of Zionism and its allies, why would these ‘protesters’ pander to such powers? The answers to these questions are of course, rhetorical. President Barack Obama, who has served the Zionist entity so well since being placed into office he has had an illegal settlement named after him (15), echoed the words of Hillary Clinton on July 13th as Western governments work closely to fight Russian and Chinese blocks and pass a resolution in the UN to take action against Syria (16). Though it would be an utterly devastating scenario for the Syrian people, it seems that another ‘humanitarian’ invasion is right around the corner. Zionist asset Bernard-Henri Lévy helped bring about a campaign of destruction in Libya and is now looking to produce the same result in Syria. Most recently, Lévy has been seen in Libya, playing an exceedingly prominent role, if not the most prominent role of all, in getting the West ‘involved’ in the murderous bombing of the oil-rich North African nation. Lévy single-handedly secured meetings for the CIA-proxy Libyan rebels with Zionist French President Nicolas Sarkozy and Hillary Clinton. He warned Sarkozy that if the West didn’t intervene, there would be a ‘bloodbath in Benghazi,’ Libya’s second largest city (1 . Thanks to the efforts of Lévy and the Zionists of the Foreign Policy Initiative who ordered President Obama to attack Libya (19), there isn’t just a bloodbath in Benghazi but a bloodbath across Libya. The NATO coalition led by the US, France and Britain has murdered at least 1,108 Libyan civilians and wounded over 4,537 others since the genocidal, colonial effort began at the end of March (20). Lévy, who is very good friends with mass murderer and Zionist war criminal (Israeli Prime Minister) Benjamin Netanyahu, conveyed to his friend that the Libyan rebels are ready to recognize the Zionist entity as a legitimate state and that they will be ‘concerned with Israeli security (21).’ Lévy’s high-level meddling in Libya has led to a scenario right out of Qaddafi’s worst nightmare: the CIA-proxy, Israeli-advised rebels are prepared to let the Zionist regime establish a base in eastern Cyrenaica on a 30-year lease (22). These activities confirm that Lévy is no mere Zionist; he is a high-level sayan (helper) doing the bidding of Tel Aviv. With Libya now in complete disarray at the hands of NATO and Israel, the globetrotting Zionist Lévy has set his sights on Bashar al-Assad and Syria. Lévy led a conference last week in Paris’s Cinema St. Germaine against the Assad government, likening Bashar al-Assad’s ‘crackdown on pro-democracy protesters’ to that of the Nazis. The conference was comprised of Zionists, former French officials, Syrian opposition figures and a Syrian Muslim Brotherhood representative. The point of Lévy’s conference was to mobilize the ex-French regime officials to lobby Russia and China in dropping their support for the Syrian Resistance government and getting both nations behind Libya-like resolutions against Bashar al-Assad. Lévy demanded that Syria be referred to an international tribunal (23). Ammar Qurabi; fake human rights activist, closet Zionist. The most disturbing of the attendees of Lévy’s meddlesome conference is a ‘Syrian opposition figure’ named Ammar Qurabi (24). Qurabi is the main source of information, statistics and rumors throughout the media institutions owned by the sheikhdoms of Qatar and Saudi Arabia and has repeatedly delivered fraudulent information and inflated protest numbers to the Zionist media (25). Qurabi’s wife writes for the London-based Saudi Arabia propaganda outlet, Elaph (26). He is frequently quoted as a ‘credible source’ by Western wire services like Reuters and AFP in regards to the ‘civilian death toll’ of the ‘Syrian Revolution.’ Qurabi however, is anything but credible. If the information initially presented doesn’t indicate that he is a stooge of the House of Saud, Qatar and Zionism, the following revelation most certainly will. Prior to establishing Syria’s National Organization for Human Rights, Ammar Qurabi worked for Human Rights Watch and the Syrian Human Rights Committee. Human Rights Watch, handsomely funded to the tune of $100 million by billionaire Zionist war criminal George Soros, has a long history of working with Zionist think tanks and intelligence agencies in fostering war propaganda, specifically against the now ravaged nation of (occupied) Iraq. The Syrian Human Rights Committee is a promoter of Human Rights Watch and Amnesty International and an affiliate of the Patriotic Union Of Kurdistan, a Mossad-linked Zionist political party in northern Iraq with a militia trained by IOF (27). Do all ‘human rights activists’ work with elements of the Zionist war machine? Clearly, Qurabi is no ‘Syrian human rights advocate.’ He is an agent of the Zionist-Saudi axis’ destabilization operations against Syria. With Ammar Qurabi keeping the lies flowing throughout Eastern and Western media and Tel Aviv’s ‘man in France’ Bernard-Henri Lévy upping the ante on the international front, Syria just cannot get a break from the Zionist entity’s mobilization. The most diabolical character in Israel’s plot to take down Syria is the government of Turkey. In the two-part series on Syria preceding this piece, this author laid waste to the theory that Turkey represented Resistance in the region and exposed the Ankara regime as a willing participant in the ongoing destabilization operation in Syria, providing intelligence, military support, safe havens and meeting grounds to Syrian Muslim Brotherhood fighters, leaders and operatives and also facilitating contact between the Zionist-occupied American government and the Brotherhood. This treacherous, duplicitous behavior is part of a 1993 Turkish-Israeli Memorandum of Understanding (MOU) that unites the two entities in military-intelligence cooperation on a large scale. The focus of this cooperation is to undermine Syria, Iran and Iraq; all enemies of the Zionist entity. The Zionist-run operations are funded with the billions in annual Turkish-Israeli bilateral trade (2 . As documented in the previous sections with the vital role of Bernard-Henri Lévy and the incitement operation in Hama carried out by the French Ambassador to Syria, as well as in the aforementioned series with France leading the European charge in sanctioning Syria, the government of Nicolas Sarkozy has played a major part in fomenting the violent unrest in Syria. Sarkozy did excessive spy work for Mossad in the 1980s and remains a high-level sayan to this day (29); his allegiance to Zionism is undeniable. Multiple sources have now confirmed to Mask of Zion that the French and Turkish governments have drawn up their own MOU, to strengthen the 1993 Turkish-Israeli MOU and to focus more intimate cooperation in toppling Bashar al-Assad. The leaked MOU document was initially provided to Mask of Zion in French and then translated by a second source. The French-Turkish MOU is between PM Erdogan himself and French Foreign Minister Alain Juppé. France, through its Foreign Minister Alain Juppé, attentively views that Turkey joining the European Union will greatly serve an important role in the Middle East. Only France has decided to provide the necessary support to the entry of Turkey into the European Union. This support was to be provided after a documented promise was made via the implementation of this agreement which serves the regional and international interests of Turkey, France and the European Union. 1. France provides the necessary support to Turkey to facilitate its entry into the EU before the end of 2012. 2. Turkey is to provide support to France on its strategic position in the Middle East, particularly Lebanon, Syria and Israel. 3. Leaving Turkey and Israel to continue military activities in Turkey as per the 1993 MOU while France provides support to both of the military units. 4. France will in turn provide the necessary support to Erdogan’s upcoming parliamentary elections, to change the Turkish Constitution to serve the process of joining the European Union. 5. Turkey to facilitate the work of the Syrian opposition by organizing meetings of the Syrian opposition in Turkey and France, under the supervision of the representative of the European Union. 6. Turkey is ready to impose pressure on the Syrian regime to control the Middle East and bring down the Assad regime’s rejection of what it views as corrupt international policy in the Middle East. 7. Turkey to facilitate the entry of the Syrians displaced and allow the French media, or any other media allies, access to Syria. 8. Enable Turkey to control the regions of Aleppo and Idlib, northern Syria in exchange for France and Britain to control the rest of the occupied Syrian territorties. 9. Despite reluctance, Turkey is to help establish a U.S. military base in the east of Deir Al-Zour, Syria and France will provide the necessary support for this. 10. France is enjoying its status within the European Union to adopt a UN resolution on the Kurds of Turkey and to propose the creation of a Kurdish state in northern Iraq as a solution for them under the direct supervision of Turkey and France. 11. France is committed to using the veto on the costs of rights of Turkey as it deems appropriate boundaries between themselves and the alleged Kurdish state established in northern Iraq. 12. Facilitate business operations through Turkish territory to Syria and Lebanon, and not check the contents of the French tanks’ transit from Turkey to Syria and Lebanon. 13. The ongoing commitment of Turkey to the Convention on the Turkish-French business in Lebanon. 14. France provides the necessary support to Turkey and unconditional support on the outstanding issues between Turkey and Cyprus. 15. France to give Turkey $45 billion in the accounts of the European Union to support development operations in Turkey after Turkey’s commitment to the provisions of this Agreement and such amounts will be disbursed in tranches based on Turkey’s obligations to the provisions of this Agreement. The document clearly (and disturbingly) speaks for itself. It is interesting to note, that like Turkish-Israeli trade, French-Israeli trade is just as lucrative, with annual profits skyrocketing to over 2 billion Euros ($2.8 billion) last year (30). The money funding the operations of the Tel Aviv-Ankara-Paris axis in Syria is awash in innocent blood, as every cent of it has passed through Zionist hands. Undoubtedly paid for by this blood money and as per number 5 in the Juppé-Erdogan Agreement, Turkey recently hosted yet another Syrian opposition conference in Istanbul on July 13th, 2011. While spouting usual, malicious rhetoric against the Islamic Republic of Iran and the Lebanese Resistance movement of Hezbollah, this meeting soared to new heights and is arguably the most dangerous to date, as attendees flamboyantly called on the Syrian armed forces to turn on Bashar al-Assad and help ‘the people’ overthrow the regime (31). As the Juppé-Erdogan Agreement and all of the evidence provided here display, it is not ‘the people’ doing anything, but a murderous nexus with the illegitimate Israeli regime sitting at its head. 13-year old Hamza Ali al-Khatib; the story of his death as reported by the Zionist media is a grossly exaggerated farce. Over the course of the last several months, one story that has permeated nearly all of the Zionist media’s coverage on Syria is that of 13-year old Hamza Ali al-Khatib, the first boy in this ‘tale of two children.’ He has become the ‘face of the Syrian Revolution,’ as many news outlets, including Zionist-created Al-Jazeera, have declared. The story goes something like this: seeking freedom and dignity like every other Syrian participating in the ‘peaceful, pro-democracy’ protests in the Dara’a Governorate, little 13-year old Hamza Ali al-Khatib hit the streets of Saida Village on April 29th, or the streets of Jiza Village, as ‘eyewitnesses’ can’t seem to be able to make up their minds. He was picked up by Syrian security forces in a routine ‘crackdown’ operation and tortured in custody for almost a month before being delivered back to his family with lacerations, bruises and burns to his elbows, face, knees, chest and feet, bullet wounds and castrated (32). Another sensational, shocking tragedy brought to the world by the Syrian Revolution. The information, extracted from a Youtube video, is said to be congruent with reports from Human Rights Watch (HRW) about the types of torture used by Syrian security forces. HRW, all of its media glory and hype aside, has been exposed as nothing more than a tool of Zionist-globalist hegemony, fabricating reports whenever the Zionist entity and its allies need justification to prepare an ‘enemy’ country for regime change (as aforementioned), so how can any claim made by such an organization be taken seriously? How can this Soros-funded band of propagandists and liars possess an almost infallible credibility when the foundation of its ‘legitimacy’ rests on pure illusion? In simpler terms, reports from HRW can’t be congruent with anything because HRW doesn’t tell the truth. The nail in HRW’s coffin comes with placing its senior researcher on Syrian Affairs, Nadim Houry, under a microscope: he’s also done work for the Rothschild-founded mega think tank, the Council on Foreign Relations, and he previously worked for the law firm Sherman and Sterling LLP, a group admittedly dedicated to furthering the interests of international bankers through privatization and globalization (33). What kind of human rights advocate also works for organizations solely dedicated to wiping out human rights worldwide through criminal wars and occupations? That is yet another rhetorical question. Beyond that, a closer look at the Youtube video reveals that there is no evidence of torture at all, and most certainly not at the hands of Syrian security forces. The body is so discolored and disfigured from the discoloration, that one cannot be sure that it is even the body of 13-year old Hamza. It certainly looks to be someone else entirely. The video is definitely graphic, but at no point does the video show that the body has been castrated. Most bizarrely, the Arabic-speaking narrators of the video continue repeating ridiculous slogans about freedom and dignity. Where is the emotion and outrage of what has supposedly been done to the child? Where is the indignation? And casting further doubt on the entire matter, at the end of the video, the narrators call on the UN and Amnesty International to take action against Syria. Suspicious does not begin to describe this footage. Contrary to reports in the Zionist Western press and Al-Jazeera, this is NOT the body of Hamza Ali al-Khatib. There is an alternative view of what happened to Hamza Ali al-Khatib, a view that has not even been given a fraction of the coverage that the mainstream (i.e. Zionist) view has. The alternative view is: Hamza indeed did take part in ‘pro-reform’ protests in the Dara’a Governorate and was indeed killed. However, the boy was not ‘murdered’ by Syrian security forces. He was caught in the crossfire of Saudi-Zionist-trained armed fighters and Syrian security officials at the Saida military housing compound. The armed brigade captured several children, including Hamza, and led them to the compound at gunpoint. They then opened fire on army, police, security forces and civilians. In the April 29th battle, a Syrian security chief was gunned down along with several others. Hamza’s body was taken to the hospital and once he was identified, he was transferred back to his family. Bashar al-Assad himself traveled to the family’s home to offer his condolences. The body in the now-infamous Youtube video belonged to that of a still unidentified man in his 20s, which was photographed and taped by Syrian opposition members (34). This information is quite congruent with previous documentation regarding opposition attacks on Syrian government targets. This information would also mean that the opposition lied about Hamza Ali al-Khatib, which is also congruent with previous documentation. Zionist-backed Syrian opposition forces have already played this game before by faking the death of a 10-year boy named “Ayham al-Ahmad.” The video quality was so poor however that the international media did not pay it any mind (35). A week and a half after the Ayham story failed, the news of Hamza, much more brutal, sensational and heart-wrenching, emerged on the international scene. Psychological warfare is the name of the game and it must not be forgotten that Mossad’s psychological warfare unit, LAP, maintains a cozy working relationship with the Zionist media (36). 14-year old Malik Ahmed Suleiman after he was strangled to death for supporting Bashar al-Assad. The second boy in this ‘tale of two children,’ is one that the greater majority of those who follow mainstream news and even those claim to be activists have never heard of. This boy isn’t marketable, nor is he profitable and unlike Hamza, his story cannot be manipulated, mutated and transformed into a media fiasco. This boy’s name is Malik Ahmed Suleiman. He was only 14 years old. Young Malik was from the city of Homs, a major battleground between the Zionist-Saudi axis’ destablization operatives and supporters of President Bashar al-Assad. 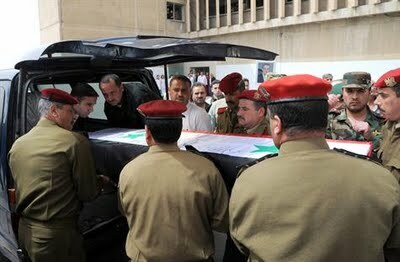 He was the son of Syrian Army Colonel Ahmed Suleiman, a supporter of President Assad and a staunch Syrian nationalist. On May 29th, while the world was incessantly clamoring about the false stories regarding Hamza al-Khatib, Malik Ahmed Suleiman was strangled to death with a belt in front of his home for holding up a picture of Bashar al-Assad during an anti-government protest. Al-Jazeera: An 'island' of Zionist propaganda. What about Al-Jazeera? Why hasn’t Al-Jazeera reported on this horrific crime? Because Al-Jazeera is nothing more than the Arab wing of the Zionist media and since 2004 alone, it has suppressed hundreds of stories of Zionist atrocities in occupied Palestine and it deliberately ignored the Zionist regime’s admission of dropping millions of cluster bombs on Lebanon during the genocidal July War (37). Ghassan Bin Jeddo, who stepped down from his post as Al-Jazeera’s Beirut Bureau Chief because the network launched a ‘smear campaign against Syria,’ said, “Al-Jazeera has resorted to gutter journalism. It is now an operations room for incitement and mobilization (3 .” Malik Ahmed Suleiman doesn’t help Al-Jazeera ‘incite and mobilize’ against Syria, he blocks it. What unites Malik Ahmed Suleiman and Hamza Ali al-Khatib is that they are both victims of a deadly, ominous destabilization campaign launched against Syria by the Zionist entity and the House of Saud. It is a campaign that has claimed the lives of police, civilians and soldiers alike and like a shark that smells blood in the water, it will not stop until it reaches its prey: Bashar al-Assad. Malik Ahmed Suleiman before he was murdered by Zionist-Saudi destablization forces. The Zionist end game is to fracture Syria into multiple states of ethnic-sectarian distinction (39), ripping apart the unified fabric of the society that has prospered under the leadership of the Assad family for decades. The means of achieving this end lies within the savage opposition, a creature of Zionist-Saudi cooperation. This creature must be exposed for the Israeli-engineered beast that it is and the plot that it represents now more than ever as Zionist mobilization continues its climb towards all-out invasion. It must be exposed for Malik. It must be exposed for Hamza. And it must be exposed for the millions of other Syrians and their children whose lives are very much at stake. It is up to the people of conscience to reject the status quo, break free from the mainstream shackles and do so. Jonathan Azaziah is an Iraqi, Moroccan-Hebrew, Russian MC, poet, activist and writer from Brooklyn, New York currently residing in Florida. His articles, poems and music predominantly deal with international Zionism and the effects that it has on the world’s oppressed people. His mixtape, Take The Red Pill Volume 2: Disarm The Octopus will be available for download soon. He is also a staff writer for Opinion Maker. http://www.opinion-maker.org/author/jonathan-azaziah/ He can be reached at jonathan.azaziah@gmail.com. Hague told Radio 4's Today program that military intervention in Syria is out of the question but went on to describe the situation in the country as “frustrating” urging joint moves by the west, the Arab world and Turkey to pressure Damascus. "It's not a remote possibility. Even if we were in favour [of UN backed military action], which were are not because there's no call from the Arab League for intervention as in the case of Libya, there is no prospect of a legal, morally sanctioned military intervention,” he said. "We want to see stronger international pressure all round. Of course, to be effective that just can't be pressure from Western nations, that includes from Arab nations ... and it includes from Turkey who has been very active in trying to persuade President Assad to reform instead of embarking on these appalling actions," he added. A university professor says gangs are committing all types of human rights violations and blaming it on the government amid the unrest in Syria. “They are really trying to violate all types of human rights. They kill people, they cut their bodies and they do all these atrocities... and then they blame the regime,” Mohsen Saleh, a professor at the Lebanese University, told Press TV. Syria has been experiencing unrest in the past few months, with demonstrations held both against and in support of Syrian President Bashar al-Assad's government. Hundreds were killed when some protest rallies turned into armed clashes between alleged protesters and state security forces as well as organized attacks by well-armed gangs against the Syrian police force and border guards in the north of the country. Saleh went on to say that the gangs committing the crimes are linked to some intelligence agencies in the US. He also blamed the Turkish and some Lebanese parties for trying to “inflame the situation” in Syria. To blame the government for the killings is the propaganda of the US in order to “maneuver” the situation in the Arab world, and swerve the revolution from its right path. New deaths are being reported in Syria as the head of the International Red Cross meets the country's senior officials. He's in Damascus discussing the humanitarian side of the conflict which has claimed over 2 thousand lives. Meanwhile, Russia is rallying members of the UN Security Council to encourage the sides to stop violence and start negotiations. The Kremlin believes President Assad has worked to change the situation on the ground through reforms, and his efforts deserve some credit. But the U.S. and its West European allies are pushing for action against President Assad's regime, which they've already sanctioned. French political analyst Pierre Guerlain believes there's an underlying motive in calls for protecting Syrian civilians. In Syria, at least six people are reported to have been killed in the latest clashes between protesters and security forces. Human rights groups continue to sound the alarm over multiple arrests and killings - but one high-profile victim has made an amazing reappearance. Ivor Bennett reports on the media's quickfire reactions at the expense of fact-checking. The European Union on Monday welcomed a newly formed Syrian opposition council, but stopped short of any call to recognise the body, which is seeking international support for a six-month-old uprising against President Bashar al-Assad. A statement agreed by EU foreign ministers in Luxembourg welcomed moves by Syria's political opposition in Syria to unite and urged the international community to do likewise. "The EU notes the creation of the Syrian National Council as a positive step forward," it said, while condemning the "brutal repression led by the Syrian regime against its population". Syria threatened on Sunday to retaliate against any country that formally recognised the opposition council. In Stockholm, a member of the Syrian National Council, formed in Istanbul on Oct. 2, said the group wants to be recognised internationally as representative of Assad's opponents, but has no plan to be an alternative government. "Our role ends with the fall of this regime," Abdulbaset Sieda, a Swedish-based member of the council's executive committee, told a news conference, saying that discussions would then be held about future elections and broadening democracy. The council includes academics, grassroots activists, the Muslim Brotherhood and the Damascus Declaration, the main grouping of established opposition figures. While some of Assad's Western critics, including the United States and France, have welcomed formation of the council, they have not embraced it diplomatically or offered military help as they did the Libyan rebels who later overthrew Muammar Gaddafi. "I think we will have to find out a bit more yet," EU foreign policy chief Catherine Ashton said before the meeting. "We need to find out more and decide what we are going to do." "I think we have been consistent in wanting to see significant change in Syria. The number of people who have died there is terrible. The continued approach of the government to repress people is awful. We've been working closely with our colleagues in the (United Nations) Security Council and with Turkey now in trying to put the pressure on." French Foreign Minister Alain Juppe, whose country was the first EU state to recognise the Libyan interim council, said the Syrian body did not "have the same structure". "So we are not at the stage of recognition," he told reporters. "But I believe we have to get to know them better and get a better idea of their intentions." The United Nations says 2,900 people have been killed in Assad's crackdown on mainly peaceful protests. The Syrian leadership blames armed groups backed by foreign powers for the violence, saying 1,100 members of the security forces have been killed since the unrest broke out in March. British Foreign Secretary William Hague did not directly reply when asked if EU states should recognise the council, but said he had met some opposition activists and continued to call on the government to end the violence. "That is the immediate priority," he said. "The EU as a whole and member states will want to appeal for (an end to violence). Of course we can't directly intervene." Juppe said France wanted to have contacts with the opposition, adding: "We are pleased to see the opposition has organised." Asked about recognising the council, Swedish Foreign Minister Carl Bildt said: "We are talking to them, as we are talking to a lot of other people who have the ability to influence events in Syria. We will be discussing that further today." Dutch Foreign Minister Uri Rosenthal said the EU should do everything in terms of sanctions to force Assad to step down. "We know that the sanctions up until now on the part of the European Union are working," he said. "We think that if that is the case we should look for more sanctions and especially for a rigorous implementation of the sanctions at hand." Officials and diplomats said a committee was expected on Monday to endorse an agreement in principle to add the Commercial Bank of Syria to a sanctions list, which would bar Europeans from doing business with it and freeze its assets in Europe once the move is adopted later in the week. EU officials say the aim, combined with already adopted sanctions on Syria's oil industry, is to block the government's access to funds, but the effect has been blunted by the decision by Russia and China to block a Western-backed U.N. Security Council resolution that could have led to broader sanctions. The Syrian capital has been the scene of a massive show of support, the biggest for months, for embattled President Al-Assad, with calls for him to be given more time to make the promise of reform a reality. Thousands of people gathered in the heart of Syria to show their support and loyalty to President Bashar Al-Assad. He is still struggling to quell a nationwide uprising despite promises of reforms.But his supporters say the government needs more time to push through change. Fourteen people were killed by gunfire in two Syrian towns on Thursday in clashes between pro- Assad troops and gunmen believed to be army defectors, a human rights group reported. Six soldiers and two army deserters as well as one civilian were killed in fighting in the southern town of Haara and five civilians were killed in the northern province of Idlib. RT's Tesa Arcilla has travelled to Damascus to see for herself what is happening on the ground. "America, out, out, Syria will stay free," chanted the crowd in the capital Damascus on Wednesday, many of them carrying pictures of Al-Assad and Syrian flags. Thousands showing their support for the government is a sharp contrast with the images of anti-government protests which have been sought in other cities. But one thing is clear – there is political discourse, sometimes even tension, trickling down to the most basic unit of society. Voices of support and continuing dissent ring out across the city, speaking of past and future unrest. Polar opposites in their demands, they are united by a newfound zeal to take a stand. What the demonstrators would indeed oppose is a decision coming from the outside. The belief that Syria’s choice should be made within the country was shared by most Damascus demonstrators. "God, Syria and Bashar," sang the students, elderly, rich and poor gathered for the rally. Their slogans warned the European Union not to intervene in their country. Two military helicopters were spotted by RT’s crew circling low over the pro-Assad rally in the Syrian capital. The helicopters flew Russian and Chinese flags, to mark the two countries’ vetoing of a UN Security Council resolution on Syria last week. Drafted by France, Germany, Portugal and the UK, the resolutions called for harsh sanctions to punish the country for the ongoing brutal crackdown on anti-regime protesters. Presidential supporter Alla, along with her husband and young children, were one of many families who braved the heat and joined the crowds in downtown Damascus. “It's true that we knew nothing about politics before but now we are taking a stand. Even if I'm a Sunni Muslim, I'm pro this president,” Alla told RT. “Ever since most people started revealing their political stance openly, some people would mock me and say, ‘Since when do you know about politics? What do you know?’ There are divisions among family members, some are pro-Assad, some are anti. But that's how it is,” she explained. It appears that political apathy is becoming less of an option for citizens of a nation now under intense international scrutiny. “We never watched the news, I was never worried, I never had an interest in politics. Now we read books, we watch the news, we read articles, we check Facebook. We want to know more. Unless you have the right background and really know your country, you can't take a stand,” says Roula Yazaji, another Al-Assad supporter. And then there are those, like political activist Louay Hussein, who are no strangers to picking a side and making it known. He has long voiced his discontent at what he calls a repressive regime. Today, Facebook is one of his main tools in co-ordinating dissent. Hussein has been thrown into jail, says he was tortured, and finds himself constantly looking over his shoulder. A call staunchly opposed by those on the other side. “Everybody wants change. Everybody wants reforms. They just have to give the government a chance. Give them time,” argues Al-Assad supporter Roula Yazaji. While political curiosity and activism among Syrians are growing whatever side of the divide they’re on, people see the future of their country is at stake. But all are adamant that that future is firmly in their own hands. Syria has been divided by six months of violent crackdowns on anti-regime protests that have left nearly 2,900 people dead, according to the UN. Pressure has been building on Al-Assad to step down, including widening international sanctions against the regime. Watch more in RT's special report. The US has pulled out its ambassador to Syria, Robert Ford, because of concerns for his safety, officials say. Mr Ford angered Syrian authorities by showing solidarity with activists involved in an uprising against President Bashar al-Assad's rule. A US spokesman said Mr Ford had left Damascus at the weekend after "credible threats against his personal safety". Last month, Mr Ford and colleagues were pelted with eggs and tomatoes when visiting an opposition figure. He was then briefly trapped in his office by pro-Assad demonstrators. An official at the US embassy in Damascus told the Associated Press Mr Ford had not been formally recalled. Mark Toner, a spokesman for the US state department, said Mr Ford's return to Syria would depend on an "assessment of Syrian regime-led incitement and the security situation on the ground". Mr Ford, an Arabic-speaker who has served in several Arab countries, has expressed solidarity with protesters as well as denouncing Syria's crackdown on its opponents. In July the ambassador visited the restive city of Hama in July along with his French counterpart, where he met demonstrators. Last month he was among a group of mainly Western diplomats who paid condolences to the family of a human rights activist allegedly killed under torture. Protests against President Assad's rule began in March in southern Syria and gradually spread across the country. According to the UN, more than 3,000 people - mostly unarmed demonstrators - have been killed since then. Mr Ford arrived in Damascus in January as the first US ambassador to Syria for more than five years. International Atomic Energy Agency investigators say they’ve discovered a secret nuclear plant in north-western Syria. They claim the complex has a similar design to a uranium enrichment plant Muammar Gaddafi tried to build in Libya. However, there is apparently no evidence of nuclear production at the site, which is currently used as a cotton-spinning plant. UN investigators say the previously unknown complex in Syria adds to suspicions that the regime worked with A.Q. Khan, the father of Pakistan’s atomic bomb, to acquire technology that could make nuclear weapons. Correspondence between Khan and a Syrian official has also been found by the UN nuclear watchdog, as quoted by AP. According to the correspondence the Syrian official allegedly proposed cooperation as well as a visit to Khan’s laboratories. A senior diplomat and a former UN investigator both provided the data on condition of anonymity. The allegations come during difficult times for Syria, which is already under immense international pressure. The timing of the IAEA's announcement is not coincidental, according to Spiked independent online magazine reporter Patrick Hayes. "It shows how those institutions are formally independent from the UN, how political they actually are. This is a way of heaping more pressure on Syria at a time when the uprising has taken place. It brings about a kind of Western interference in a kind of insidious fashion. They are basically doing what they did in Iraq: using the guise of weapon inspections to poke their noses into all areas of countries that seem a bit suspicious," Hayes told RT. Dr David Halpin, a British anti-war activist agrees with Hayes. Political analyst Rabia Qais says that Syria’s nuclear program is not a new issue for the international community as it has been raised many times in the past. He believes that Syria, like any other country in the region, is determined to have its own nuclear program to defend itself from a possible attack by Israel, as Israel is the only country in the Middle East that does have nuclear weapons. Whitlock, Craig. "U.S. Secretly Backed Syrian Opposition Groups, Cables Released by WikiLeaks Show." Washington Post, 17 Apr. 2011. BEIRUT: Deputy head of the Hezbollah's executive council Sheikh Nabil Qaouk accused Arab leaders Wednesday of working with the U.S. in an attempt to topple President Bashar Assad’s government. “Lebanon and its resistance cannot be [associated with] Arabs who are U.S. agents involved in the aggression against Syria,” Qaouk said during a ceremony in Beirut’s southern suburb of Ouzai. “[Lebanon] would never take a position of treachery or conspire against Syria nor punish it politically, financially or economically,” Qaouk added. The Arab League voted Saturday to suspend Syria’s membership, citing Syria’s failure to implement an initiative by the league to end the eight-month crisis in that country. The regional organization also said it would impose political and economic sanctions against Damascus. Lebanon voted against the decision with President Michel Sleiman warning that isolating its neighbor could result in dangerous repercussions. During his speech Wednesday, Qaouk, who described the Arab League as being dominated by the United States, said the body was failing to play “role of the fair mediator,” and that Syria would overcome conspiracies against it. Last week, Hezbollah Secretary-General Sayyed Hasan Nasrallah warned that any attack on Syria or Iran would engulf the region, prompting analysts to assume that Hezbollah would join the fight but against the Jewish state by opening the south Lebanon front. During his speech Wednesday, Qaouk said the allies of the U.S. and Israel in Lebanon and the region were seeking to weaken Syria and Hezbollah. "The American-Zionist project and its tools in Lebanon and the region is betting on weakening the resistance through the crisis in Syria and work to exhaust and weaken the regime in Syria,” the Hezbollah official said,” Qaouk added. BEIRUT - The Arab League said Wednesday that Washington overstepped its bounds by saying Syrian President Bashar Assad had lost the legitimacy to lead his country. Speaking to reporters in Damascus, Arab League Chief Nabil Elaraby said Assad assured him that "Syria has entered a new era and is now moving on the road of a genuine reform." Syria came under withering international criticism Tuesday as the White House said Assad has "lost legitimacy" and the U.N. Security Council condemned attacks on the U.S. and French embassies in Damascus. It was a sharp escalation in pressure on Assad and a sign that the Obama administration could be moving closer to calling for regime change in Syria over the violent crackdown on a four-month-old uprising. Previously, the U.S. position on Assad was that he should lead a transition to democracy or leave. Elaraby said nobody has the right to say that the president of any country has lost his legitimacy. "This issue is exclusively decided by the people," he said after meeting Assad. Since the uprising began in mid-March, the Arab League has been mostly silent about the situation in Syria. Last month, Elaraby's deputy, Ahmed bin Heli, said Syria was a "main factor of balance and stability in the region." Elaraby repeated that position Wednesday. Also Wednesday, Syria's Foreign Minister Walid al-Moallem said he regretted Monday's attacks by government supporters on the U.S. and French embassies in Damascus. "Whoever did that was wrong," al-Moallem said, adding that Syria is responsible for protecting the embassies and their staff "and we bear full responsibility for that." Hundreds of Syrian government supporters smashed the embassies' windows and spray painted walls with graffiti. Three French Embassy workers were injured. Earlier Wednesday, Syria's Oil Ministry said fire damaged a natural gas pipeline in eastern Syria. It was unclear if the blaze was accidental or sabotage. No casualties were reported. Syria's state-run news agency said production continued using other pipelines. Syria produces about 350,000 barrels of oil per day as well as natural gas. There were conflicting details about the fire late Tuesday in Deir el-Zour province, near the border with Iraq. Witnesses said they heard an explosion, raising concerns that there had been an attack. But Syria's Oil Ministry denied any explosion and said a fire erupted on a pipeline that was under maintenance. Syria's oil exports are among the main earners of foreign currency to the government, particularly now that the country's four-month-old uprising has hit the tourism industry. Last year, tourism accounted for roughly 12 percent of GDP and brought in $8 billion in hard currency. Reports of an explosion at the Al-Furat Oil Company's pipeline raised concerns of an attack, which would be the first of its kind as the country tries to quell the revolt against President Bashar Assad's regime. Russian warships have entered Syrian territorial waters in an aggressive move designed to prevent any NATO-led attack on the country under the guise of a “humanitarian intervention”. On Thursday, the Associated Press reported that Russia and China vetoed a United Nations resolution on Syria because they feared NATO would use the move as an excuse to bomb the Middle Eastern country. Moscow said it opposes any resolution against Syria because of the way the United States, Britain, and France interpreted the resolution against Libya and used it as an excuse to invade the country and depose its leader Gaddafi under the cover of protecting civilians. NATO exploited language in the resolution that authorized U.N. members to take “all necessary measures … to protect civilians and civilian populated areas under threat of attack” while excluding any “foreign occupation force” in Libyan territory. Russia, China, India, South Africa and Brazil argue that the Libya resolution did not justify months of air strikes against Gaddafi’s regime that killed at least 6,000 civilians. They believe a new resolution might be used in the same way to attack Syria and depose al-Assad. Despite the wrangling at the United Nations, WorldNetDaily reported on Tuesday that a senior Syrian diplomatic official told the news website NATO troops are training in Turkey for a Turkish-led NATO invasion of Syria. At the same time, Middle East security officials said Russia has been inspecting Syrian forces and has advising Syria about possible Syrian military responses should NATO attack the regime of al-Assad, according to Aaron Klein. Russia has sold a large number of Iskander ballistic missiles and the officials said considering the threat of NATO invasion the Russians are looking at selling Syria its advanced S-300 anti-missile system. Assad, however, is concerned the European Union and the United States may dangle a carrot and dissuade the Russians from supporting Syria. Assad has said if his country is attacked he will set the Middle East on fire. “If a crazy measure is taken against Damascus, I will need not more than six hours to transfer hundreds of rockets and missiles to the Golan Heights to fire them at Tel Aviv,” Assad reportedly said, according to Iran’s state-run Fars news agency. Assad made the comments in a meeting with Turkish Foreign Minister Ahmad Davutoglu on Tuesday, according to Ria Novosti. It is reported Davutoglu relayed a message from NATO and the U.S. that Syria may face an international military campaign if al-Assad does not stop an alleged violent crackdown on an insurgency against his regime. Assad reportedly warned that he will call on Hezbollah in Lebanon to launch an all-out missile campaign against Israel. He said Iran will attack U.S. ships in the Persian Gulf along with European interests. WND also reports that Egyptian security officials said Assad instructed the Syrian military to be prepared for an air or ground campaign. I didn't spot this one on the Military Industrial Hypnosis machine the BBC! “Russian warships are due to arrive at Syrian territorial waters, a Syrian news agency said on Thursday, indicating that the move represented a clear message to the West that Moscow would resist any foreign intervention in the country’s civil unrest,” reports Haaretz. Russia has stepped up efforts to defend Syria in recent days, with Foreign Minister Sergei Lavrov keen to frame the violence in the country as a civil war in defiance of claims by western powers that President Bashar al-Assad has overseen a bloody crackdown on innocent protesters. As we saw prior to the attack on Libya, which was also framed as a “humanitarian intervention,” NATO powers are keen to demonize Assad’s government by characterizing attacks by his forces as atrocities while largely ignoring similar attacks by opposition forces, such as this week’s raid on a Syrian air force intelligence complex that killed or wounded 20 security police. Of course, we heard similar rhetoric even as NATO-backed Al-Qaeda rebels were commandeering fighter jets and firing rocket-propelled grenades in Libya, actions also undertaken by “innocent protesters,” we were told at the time. As we have previously reported, despite overwhelming speculation that Iran will be the next target of a military assault, Syria is the likeliest target for the next salvo of NATO-backed regime change. US President Barack Obama got the ball rolling back in August when he called on President al-Assad to step down. The UN has already withdrawn all non-essential staff from the country. Without Russia’s help, Syria would be largely defenseless against a NATO attack. “I don’t see any purely military problems. Syria has no defence against Western systems … [But] it would be more risky than Libya. It would be a heavy military operation,” former French air force chief Jean Rannou commented. WELL WELL WELL very good move by Russia to prevent further blood shed on the name of humanitarian intervention. As I am shouting out loud to so called intellectuals that CAPITALISM is on its knees and it need blood. As they are planning three WARS in this decade, an attack on Syria, attack on Iran and attack on Pakistan. What ever you do they will trigger these WARS as if they don't then these westerners are history. So they will take every dirty step in their books to save their skins. Therefore I request to Russia and China to intervene and intervene fast and with boldness else your next. Tell Americans and Britishers that we are coming to USA and UK to save OCCUPY WALL STREET PROTESTERS on humanitarian grounds.